Put an end to all the trouble caused by noisy next door neighbors by learning how to block the noise. Find the quick ways to reduce noise coming through your shared walls and tips to block other annoying sounds as well. Changing apartments is the perfect opportunity to start over. You embrace the new atmosphere, the new neighborhood and the new color of your walls. Things are different than how they used to be. You don’t know what to expect. But you’re willing to give it a shot. If you’re lucky, you’ll have amazing and considerate neighbors. Both you and your neighbor can enjoy an uninterrupted time within your homes. But that’s a very rare situation. What’s more common is that you’ll either end up with really loud neighbors or really quiet ones having a loud dog in their house. Once the first few weeks have passed, you will begin to lose your cool. A persistent headache from all the unnecessary noise and the interrupted sleep will accumulate until the day you finally realize you’ve had enough. But what happens after that? The answer to that question is what this article will reveal. A lot of people opt for more expensive solutions without trying this simple and quick fix. Here’s the thing — sometimes, your neighbors have no idea they’re causing too much noise. In this case, if you voice out your discomfort, they’re sure to lower their volume, whether it’s the music or their voices. Of course, you have to make sure you do this in a friendly manner. Perhaps, by inviting them over or paying them a visit. This could even be the start of a friendship between you and your neighbor. After all, maintaining good relationships with the people around you is essential because, in times of danger, they’re the first ones who can come to your aid. However, unfortunately, the world isn’t all filled with nice people. Sometimes, your concern could infuriate your neighbor, especially if you’re new to the neighborhood. If this happens, or you just don’t notice any difference even after talking to them, it’s time to take the next step: invest in ways to block out any unnecessary noise coming from your neighbors. 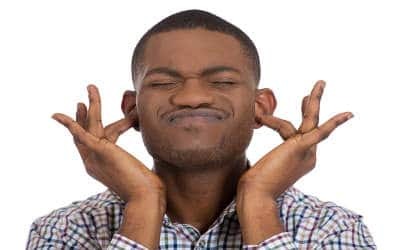 Before you can successfully block the neighbors’ noise, you have to know some basics about the sound and how it travels..
A sound is produced by a movement of a specific object, for example by your neighbors vocal cords, footsteps, TVs, etc. This movement causes vibrations that travel through the air in the form of sound waves. To block the noise from next door neighbors, you have to figure out how to stop these sound waves from reaching your apartment or at least try and slow them down. The best way to achieve this is by adding thick and dense soundproofing materials that are capable of blocking the noise physically. Sound absorbing materials, on the other hand, don’t do much in terms of blocking, but they do dampen the sound and still make the room feel quieter. The wall you share with your neighbor could be the biggest culprit in this case. This is because the sound from their TV, voices or their pets will pass through this wall (especially if it is very thin and lacks proper insulation). It is most probably the reason why you hear them so loudly. Obviously then, the solution is to soundproof this wall that you share with them. In order to gauge whether you want to invest in a simple fix or a more permanent solution, consider the source of the noise. If it’s from their TV or their talking, a quick and simple fix should suffice. However, if the noise is intolerable and causing too much discomfort, you might want to opt for a more professional solution. Another important point to consider is whether you’ve rented the apartment or whether you own it. Of course, if you’re only a tenant, there is no point in investing in permanent solutions. They also tend to be more expensive. If you own the place, then it would be wiser to spend a bit more and soundproof the wall for good. This would be better for you than spending on soundproofing the wall multiple times. Here, you will discover some remarkable, cheap and effective solutions for reducing noise coming through shared walls. They might also come in handy if you’re not in the position to invest too much in professional soundproofing methods. Believe it or not, this is a great way to block out sounds. The reason is that sound waves weaken when they have to pass through several objects. In your case, the first object would be the wall. So if you rearrange the furniture in the room and place something like a cabinet or a bookshelf against that wall, there will be more objects for the waves to pass through. If you’re using a cabinet, fill it up with clothes and if it’s a bookshelf, fill it up with books. However, make sure you don’t place something like a couch or a bed against the wall. Actually, avoid placing any furniture you might use frequently. Remember, you’re trying to reduce the discomfort caused by all that noise. Creating a sitting or sleeping area just next to the shared wall will definitely not solve this problem. If you can’t find something big and bulky to push against this shared wall, go Da Vinci with it instead. You could even do this AFTER placing some furniture against the wall. All you need to do is use some of the best paintings lying around your house or put some of the best photographs into frames and hang them up the wall. You could even use one large painting that would add definition to the room. Just make sure it’s something that won’t dull down the room. Although this isn’t the best solution, it is still one of the solutions you can resort to. Especially if you’re in the mood to shake things up a bit, this could be a two-in-one fix. What are acoustic wall panels? They are products that were specially designed to absorb and dampen sound. Acoustic wall panels are made of a wooden frame and covered with fabric such as silk or polyester. Most manufacturers provide the option of customizing these panels. Since they don’t look very different from pictures, many people even use them as wall decor. Because of how attractive they can look, it’s easy to get carried away and purchase a panel merely for its looks. Remember, the problem is your noisy neighbors. If you want to dampen their sound, you will need a panel that is thick, preferably one that is more than 2-inches thick. As a tenant, this would be a great way to fix the sound problems because you can always remove the acoustic wall panels when you decide to move into another apartment. Acoustic foam is slightly different from acoustic panels. It is less attractive, but it is also less costly and easy to install. These foams work by increasing air resistance, which will reduce the amplitude of the sound waves. Although acoustic foam is not completely soundproof, it can still dampen sound to the extent that you will notice a difference. Another product you could use are panels from Burton Acoustix. Although they are 5–8 times denser than studio wedge foam, they are so light that they can be put up with tape or blu tack. Not to forget, Burton Acoustix also looks better than studio wedge foam. What’s more is it doesn’t cause any damage to the walls and can be put up by just about anyone. The four solutions mentioned so far are easy and are sure to make a difference. However, if you own the house you are living in, you might want to invest in a more permanent solution. After all, all that was mentioned above are only temporary ways to solve the problem. So, for you, the house owner, we have slightly different options. If you think your car is so much quieter than your house, here’s the reason why — it has MLV! MLV usually comes in a roll and is made of vinyl and tiny particles of metal. The vinyl gives the material flexibility while the metal particles dampen the sound waves. Nowadays, MLV is gaining increasing popularity because it not only solves the noise problem but it is also an environment-friendly solution. It can be used to soundproof the different areas in your house such as the ceiling, the walls, and even the floor. The only problem with MLV is that it usually comes in plain black so sometimes, it could be an eyesore when it is put up. If you’re an interior fanatic, this could really irritate you. If you want to fix this problem, you can either hang paintings or place furniture against this wall. An even better way to disguise it would be to put up another layer of soundproof drywall. That is it! Now you can enjoy the peace and quiet you’ve been seeking all along. This is the last solution we have to offer, so it is more expensive than all the others. However, installing an additional layer of drywall is an effective way to soundproof your house for good. If you’re thinking about renovating your house anyway, you might as well go for this option. What is drywall? It is a panel made of gypsum that is used in the construction of interior walls. Perhaps, you’re more familiar with the terms plasterboard, sheetrock or gypsum panel. Drywall comes in a variety of variety based on the purpose it serves. Since you’re looking for a way to soundproof your house, you will need to purchase the soundproofing version available. But a regular drywall will work just fine too. The best part about drywall is that soundproofing is just one of its many benefits. A few others are that it is durable. In fact, it can even withstand fire. In case it does get damaged by a leaking pipe or a poorly drilled nail, you should be able to fix the damage in no time. If you want to know more about drywall, we have an article that focuses entirely on soundproofing using drywall. You will find the link here. In case you’re not ready to invest in soundproofing your house just yet, but you’re not able to cope with all the noise from your neighbors either, here are some simpler solutions for you. White noise is a great way of masking out external sounds. To do this, there are special white noise machines that play a combination of sounds, at different frequencies and at the same time. In case it sounds like another noisy disturbance, don’t worry, because it isn’t. White noise machines usually play realistic sounds such as rain in a forest or the waves of the ocean. If you think of it, does your neighbor’s noise bother you so much when it rains? It probably doesn’t. Now imagine you had a machine that could fake the sound of rainfall all the time. That is what a white noise machine does. The good thing about this option is that although the sound can mask out your neighbor’s loud television set or music, it won’t disturb them. The sounds are only high enough for you and won’t reach them all the way through the wall. So you won’t have to feel bad about causing the same discomfort they are causing for you. White noise machines are easily available for purchase on websites such as Amazon. They come in a range of styles and prices. Usually, you can also select a white noise of your choice. If you look hard enough, you will find ones that have a range of different sounds. For those of you who want to read more about white noises and how they work, you might find this article useful. In case you are unable to buy a white noise maker, perhaps you could try playing some background sounds on YouTube. You might even find some royalty free audio clips available for downloading on the internet. These sound clips usually play for a good couple of hours before they shut off so they are an effective alternative. If none of this is available to you, you could try playing mainstream music on the radio. Playing such background sounds won’t shut out your neighbor’s noise. But it can give your ears something else to pay attention to. This could prove to be especially helpful if your neighbor’s noise doesn’t let you sleep at night. Sometimes, even playing some background sound out loud may not serve the purpose. For instance, when there is something important that you want to listen to. In such instances, noise-canceling headphones can be very useful. They are available in a variety of shades and styles and can be purchased from a number of stores. The downside of this alternative is that these headphones are quite expensive. But once you’ve purchased them, you can expect to use them for a really long time. Also, wearing headphones all the time inside your house just may not be as practical as it sounds.